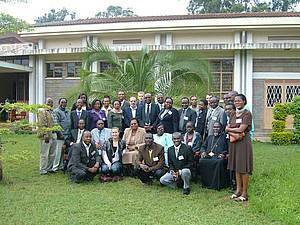 Participants in the conference on 'Christian communities in contemporary contexts' (Theme 7) at the Carmelite Center Karen, Nairobi on 26-28 May 2009. Dr Philomena Mwaura is seated, centre (in brown). As the culmination of a year-long study process, 46 church leaders, theologians, scholars, clergy and lay people attended the event from Kenya, Uganda, Tanzania and Zambia and included Protestants, Catholics, Evangelicals and members of African Initiated Churches. The study process entailed 'a critically honest evaluation' of Christian mission in East Africa and an assessment of the mission situation globally. The conference concluded that Christian mission is 'proactive engagement in empowering not disempowering; peace-building, healing and reconciling not causing conflict, injuring and segregating; loving and all inclusive not marginalising', and also involves proclamation and presence. Download the programme for the consultation (MS Word file) here. Download the conference statement (MS Word file) here. Download the report of the consultation (MS Word file) here.